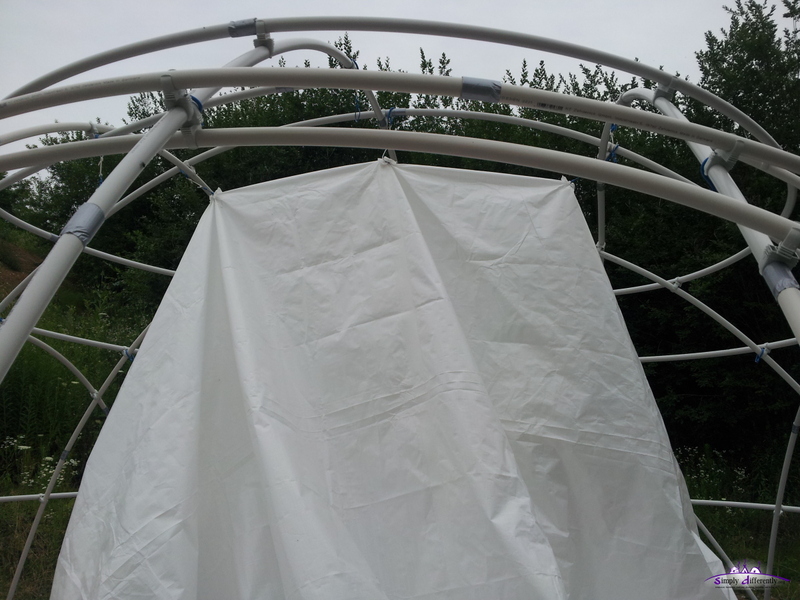 and the expected thunderstorm at the evening did not arrive, instead it came at night. 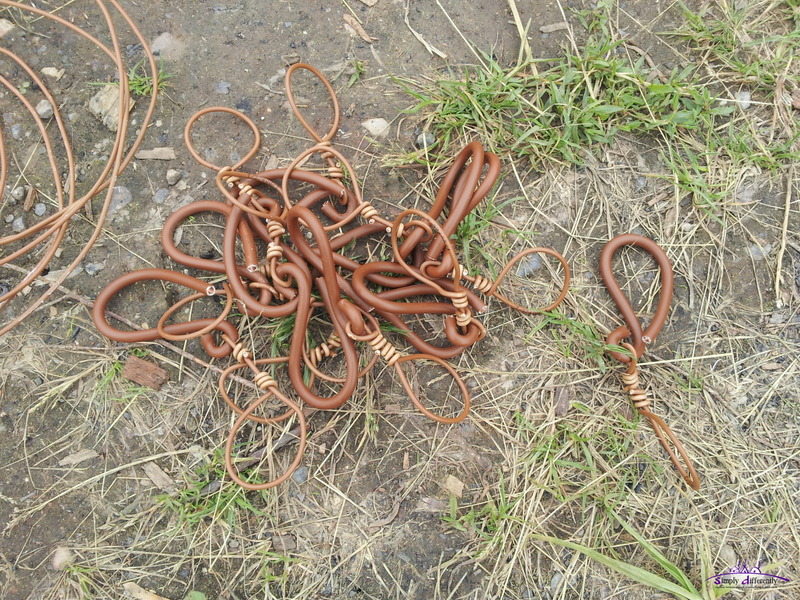 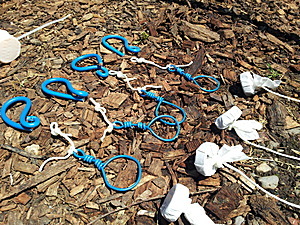 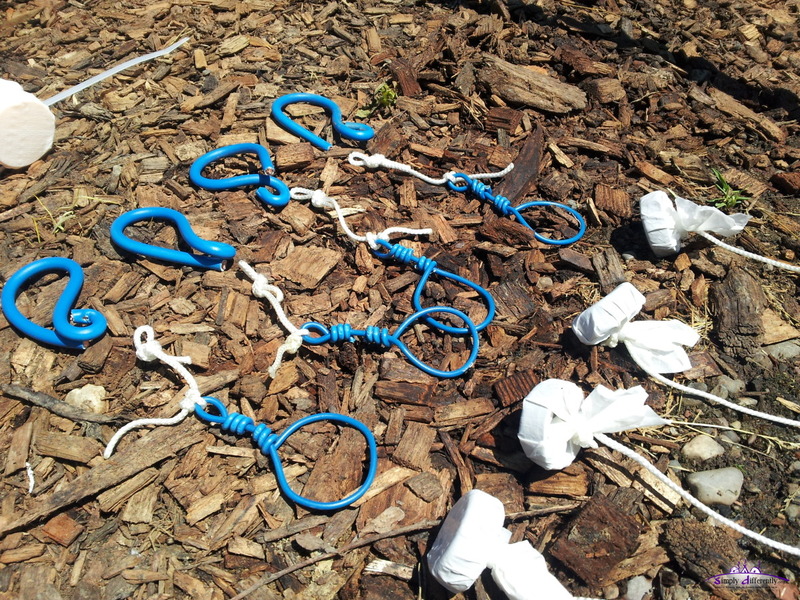 with 30cm long 3mm cord with a knot at the end. 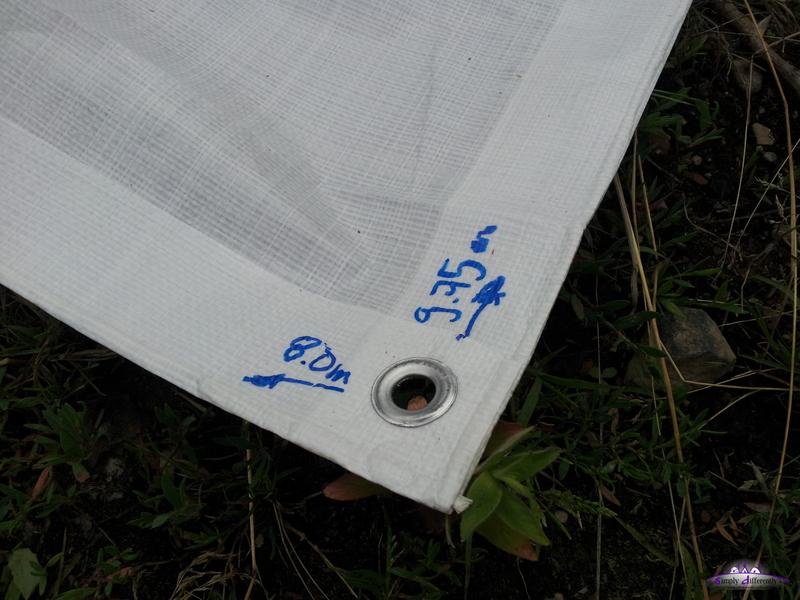 The Protection Patch on top of the rain cover is about 8cm x 8cm PE patch, just covering the bottle cap. 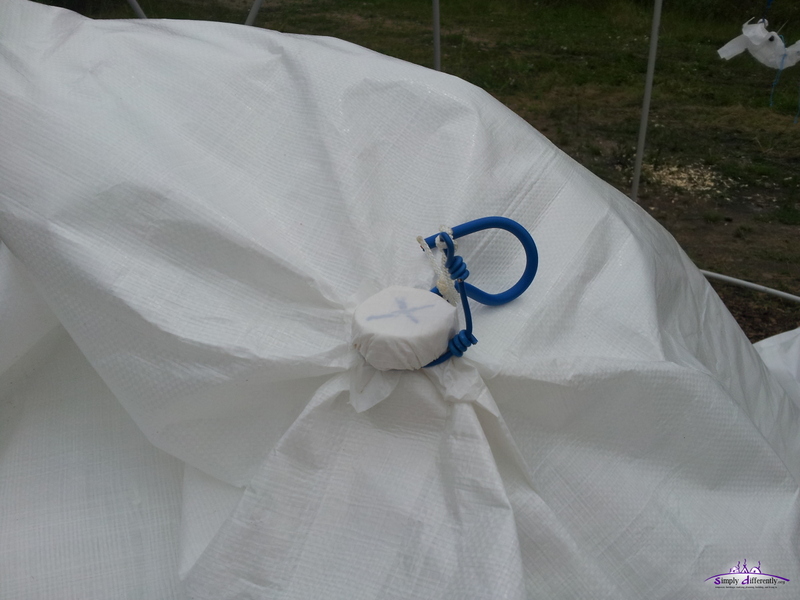 The Wire Capture is a 1.5mm diameter blue insulated wire, apprx. 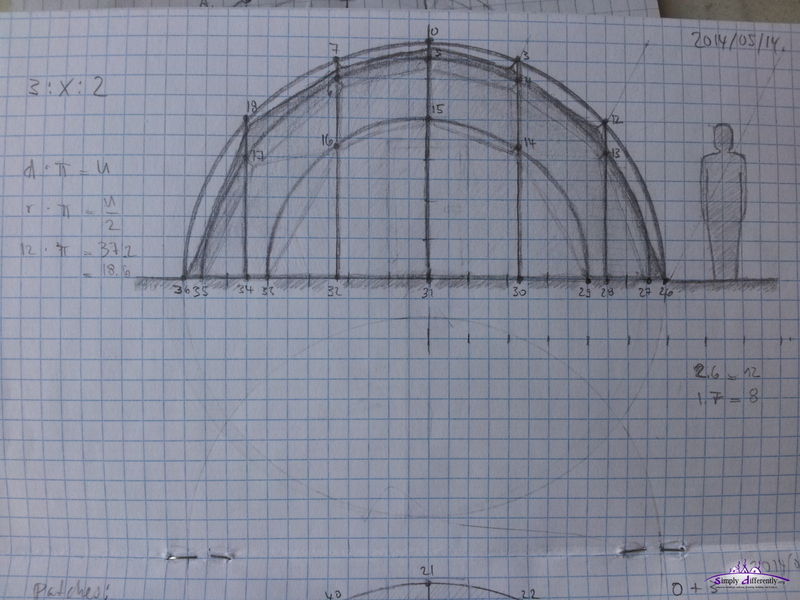 30cm long and then formed accordingly by hand. 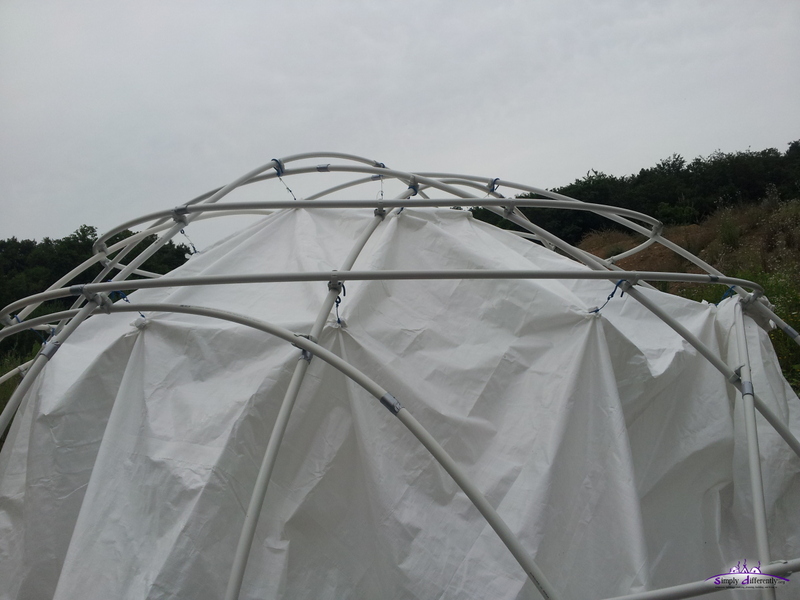 For the 5 top connectors I used a cord in between, as the dome is 4.95m in diameter, and 2.65m high, slightly elliptic or egg like - which means, I like to compensate a bit and make the top connectors longer for the rain cover, hence the cords, but on the more vertical connectors I connect the Wire Capture directly on the Wire Hooks. 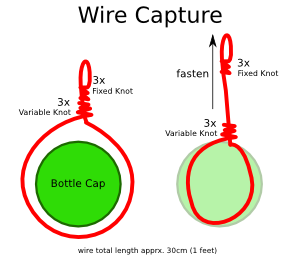 Since it's my first setup I will use the Wire Capture, which allows me to open and close the capture easily and reposition it without hassle. 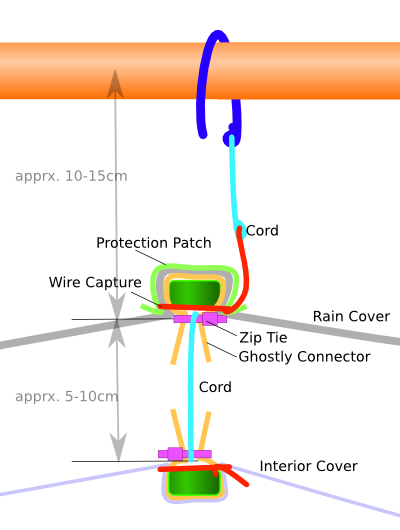 While testing I saw the PE rain cover brittles a bit already with multiple fixations and releases, therefore I thought to add a "Protection Patch" on top, apprx. 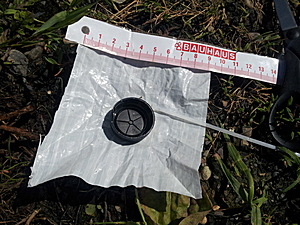 10cm x 10cm to wrap around the bottle cap. 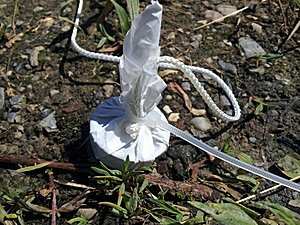 The "Ghostly Connector", where I use a zip tie so I can use a cord to manage the distance from the capture to interior cover and also protect from possible sharp edge of the bottom of the bottle cap. 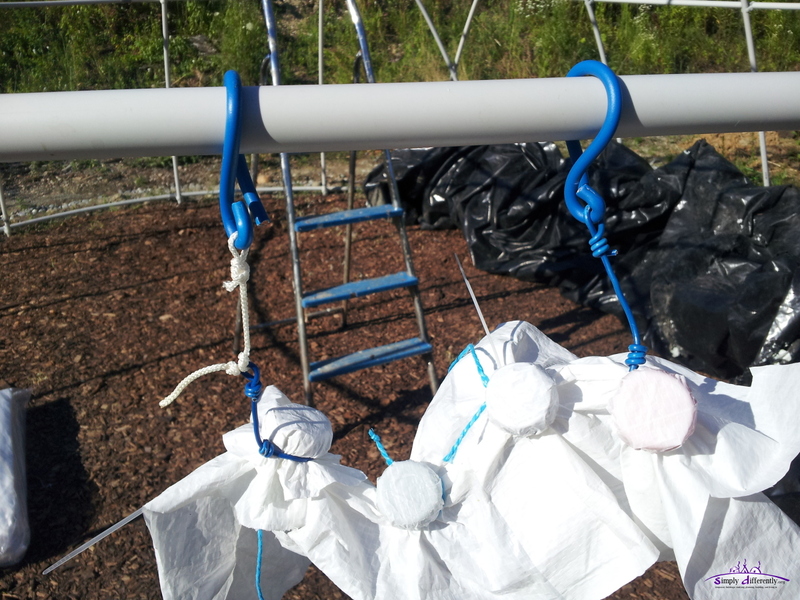 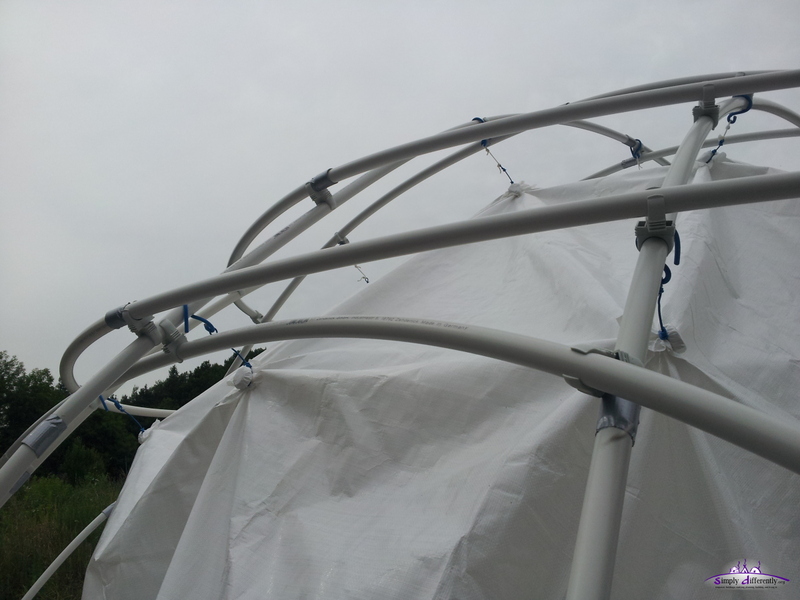 Currently using the "Wire Hook" variant for the 4:x:3 5.1m Dome with 2m x 25mm tubes. 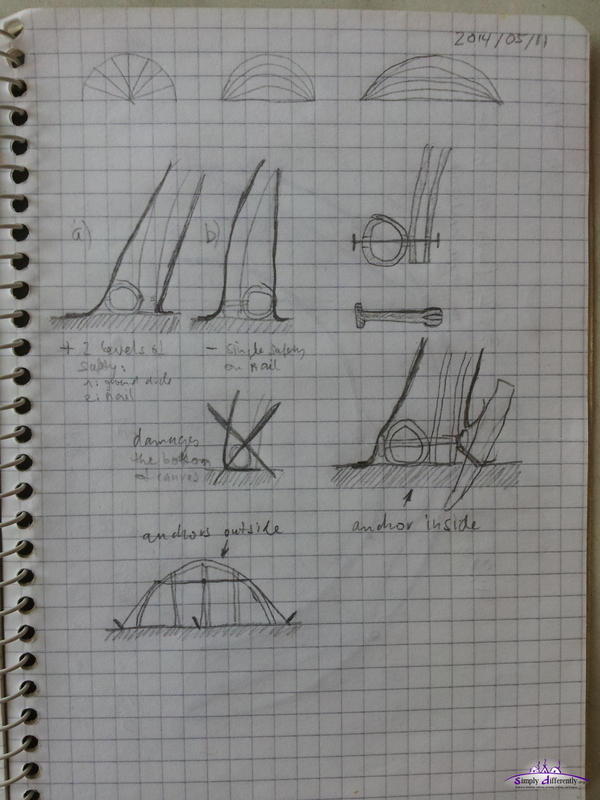 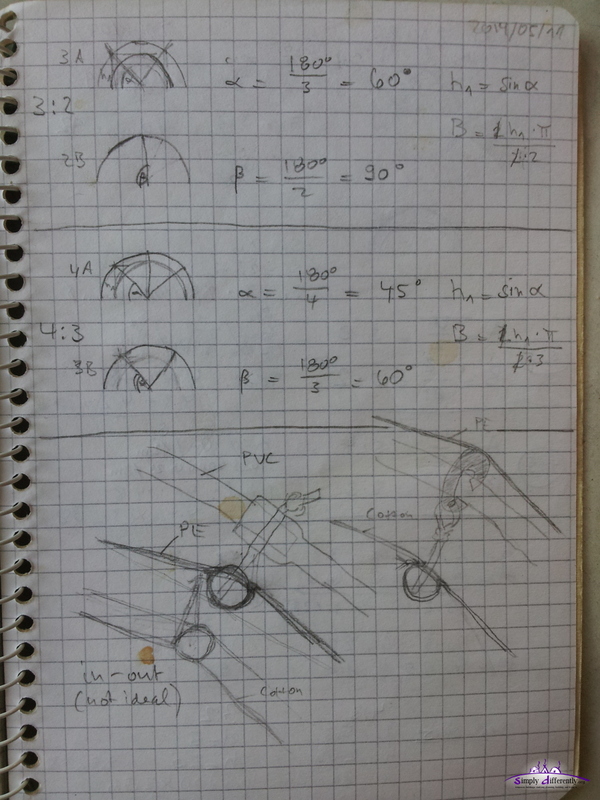 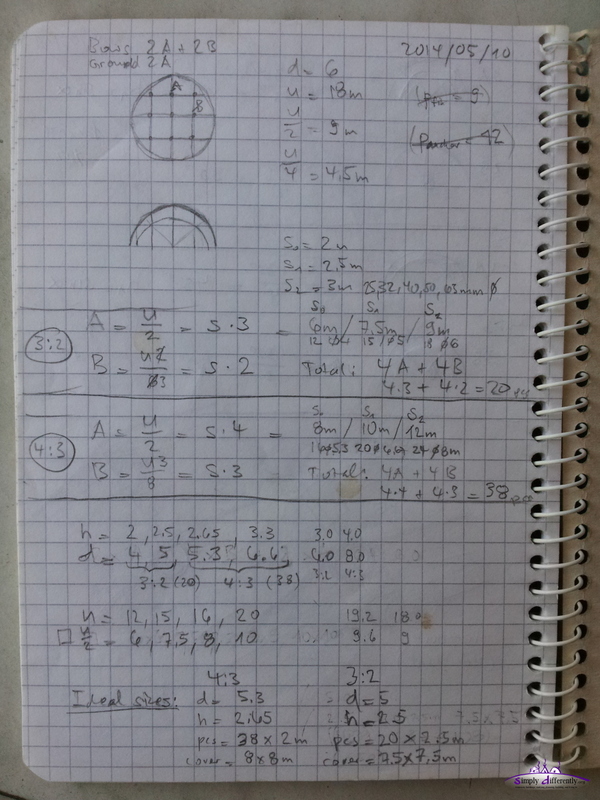 Yesterday I fine-tuned the rings a bit, and came up with an elegant solution: I lowered the 7a ring, but left one section open where the main entry will be. 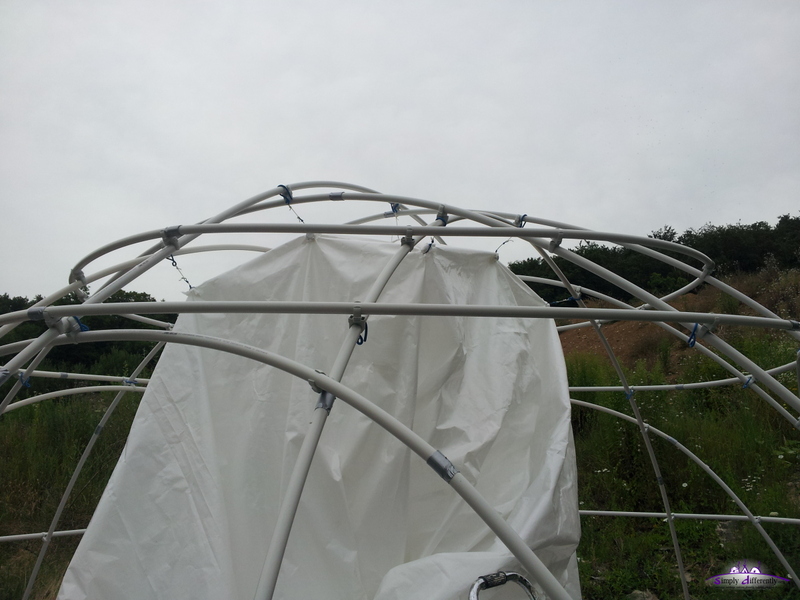 Lowering the 7a ring improved the overall stability of the dome; as you may have read in the earlier entries, I wasn't so impressed using 25mm diameter 2m pipes for 4:x:3 setting, too wobbly at first, but with the additional rings holding the dome together the overall stability improved. 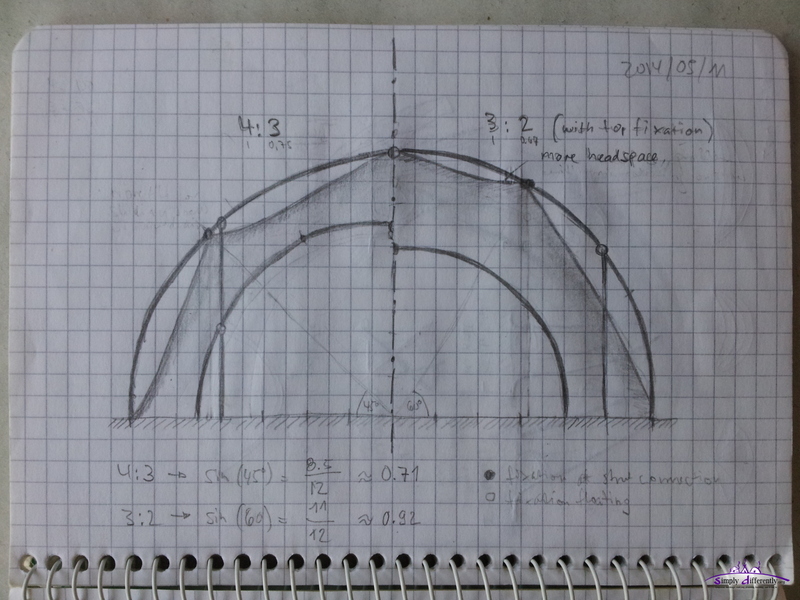 As written before, increasing the diameter to 32mm or even 40mm pipes seem not feasible, as their fittings are still only 30mm long, which makes the intersection very weak for bending to a bow. 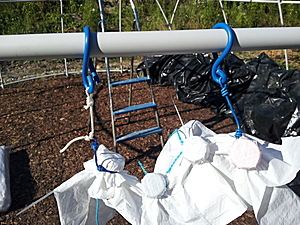 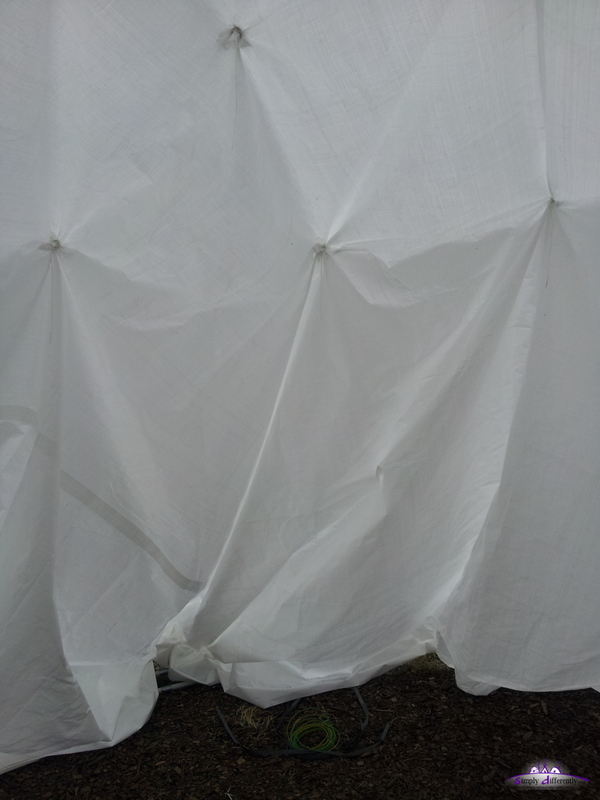 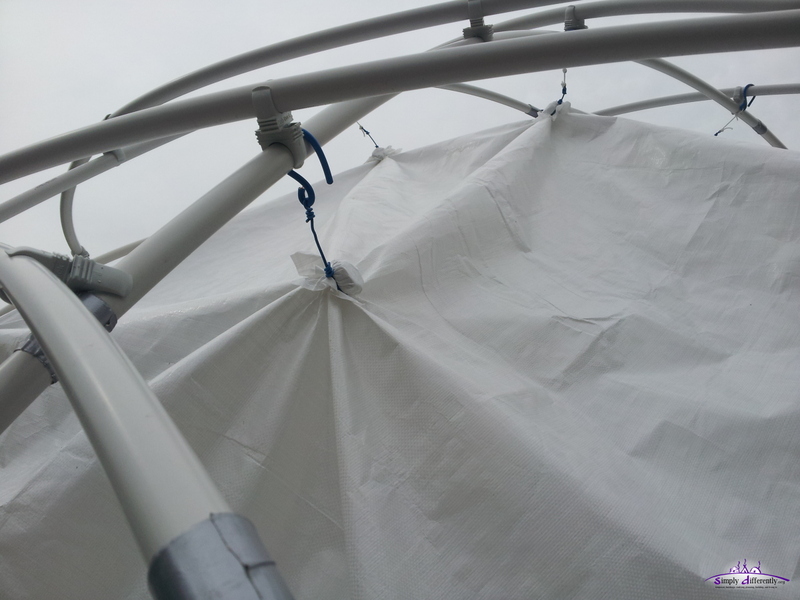 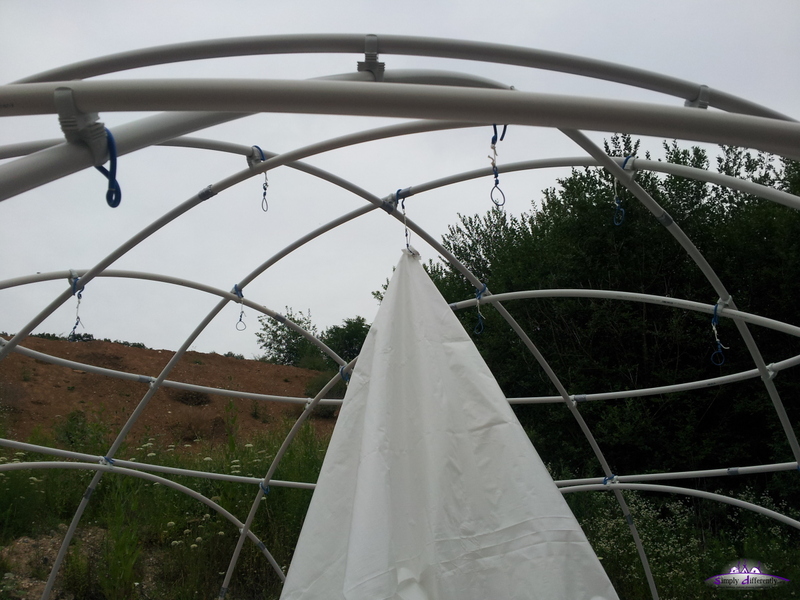 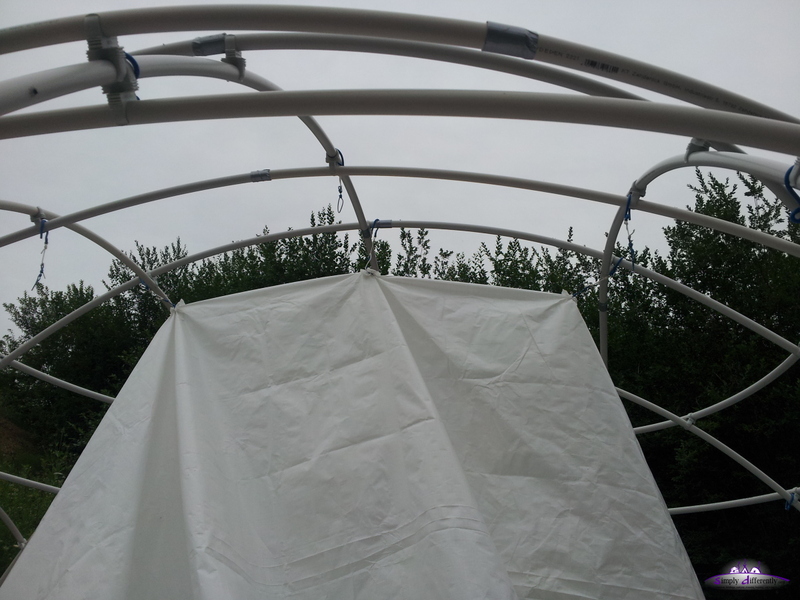 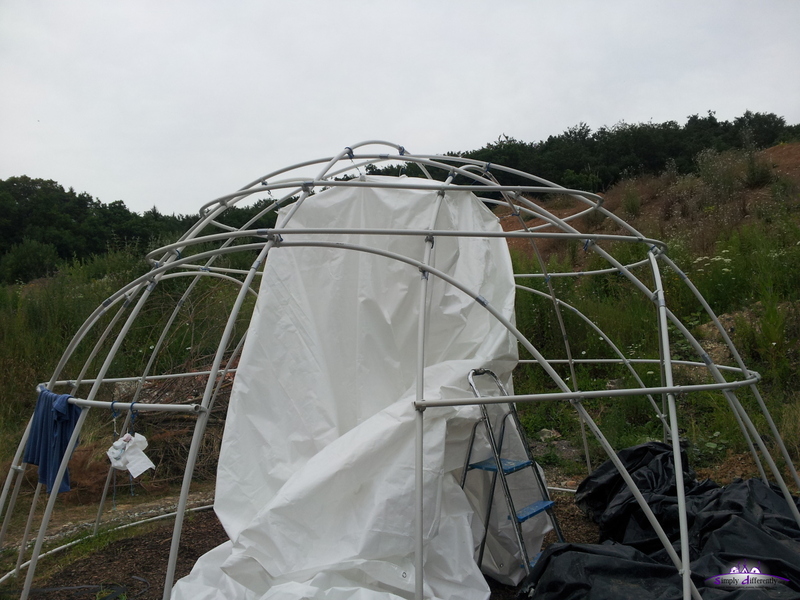 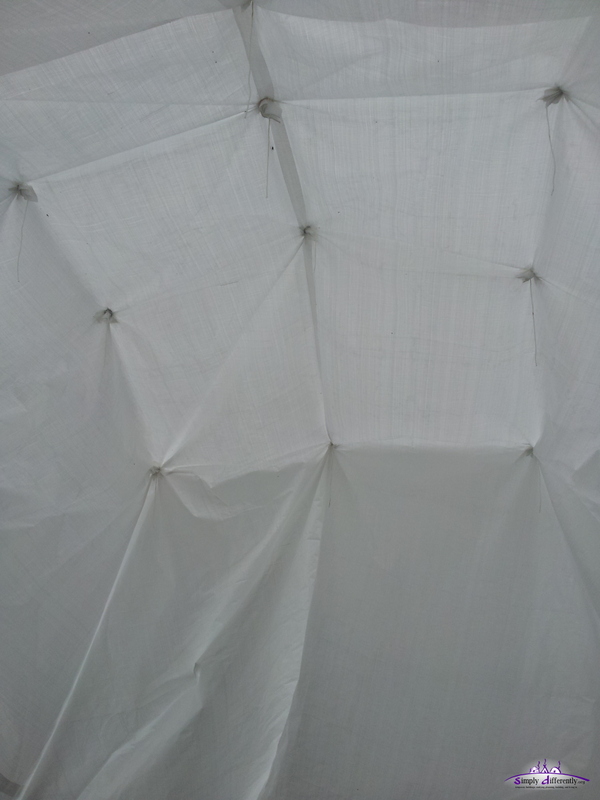 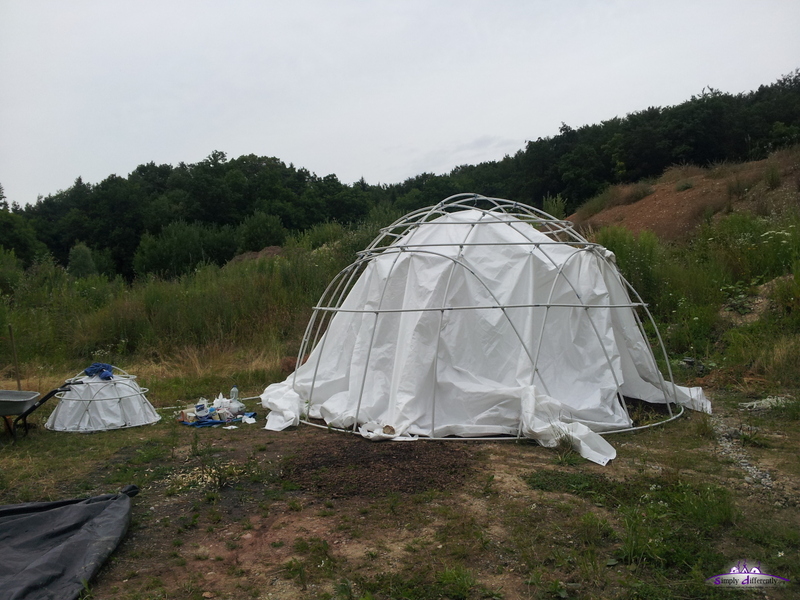 Additionally I worked with a strong insulated wire to form a hook to attach later the rain cover, easy to put on and also easy to take off again, yet, also being able to "break" there in case of heavy storm and rather not take down the entire dome, but just the rain cover disconnect. 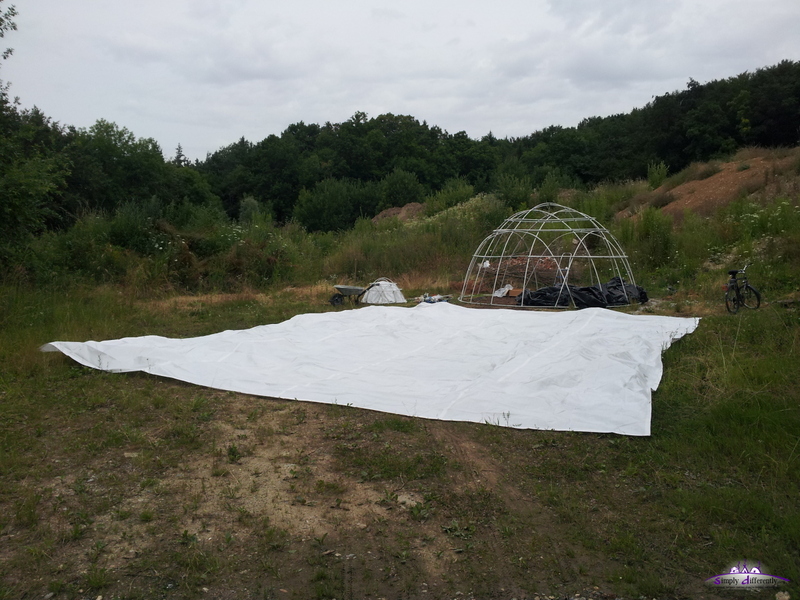 I prepared the base where the final dome will reside, a bit of sand and wood chips on top - around a small drainage to make way for water in case of heavy rain. 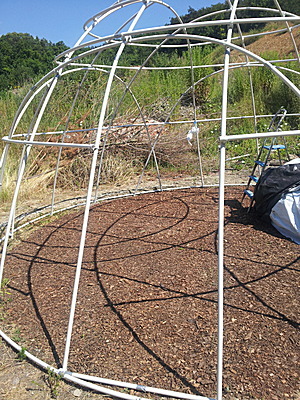 This time it worked better, likely because the ground wasn't that tilted as the first time I pitched the 4:x:3 dome. 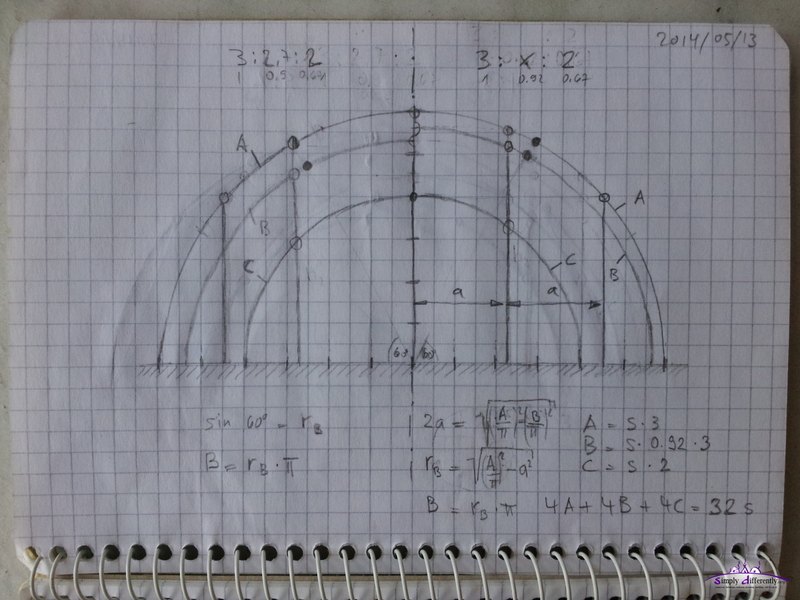 The Ax I could do with the cut a tubes for the 4:x:3 - so the nice thing is, since I looked for as little cuts as possible, I was able to put together 3:x:2 (3.8m diameter) from the 4:x:3 parts (5.1m diameter), plus 4a ring on the top. 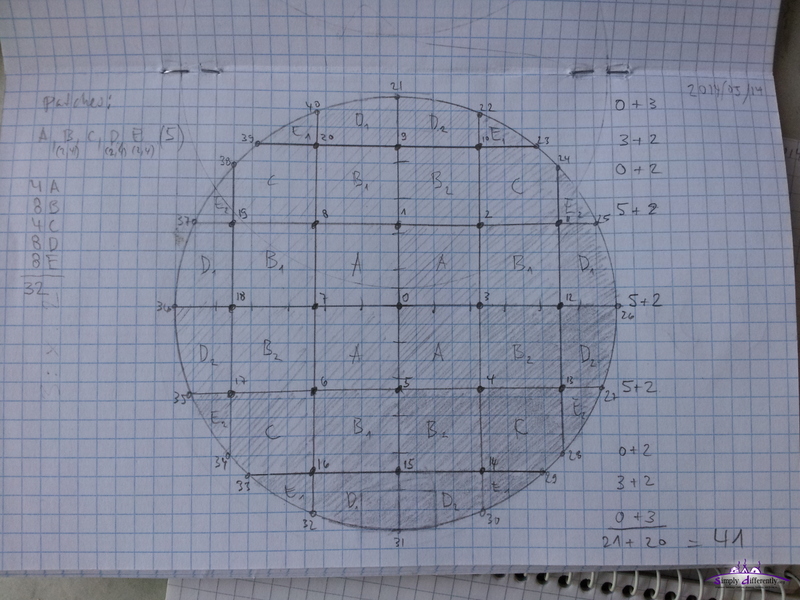 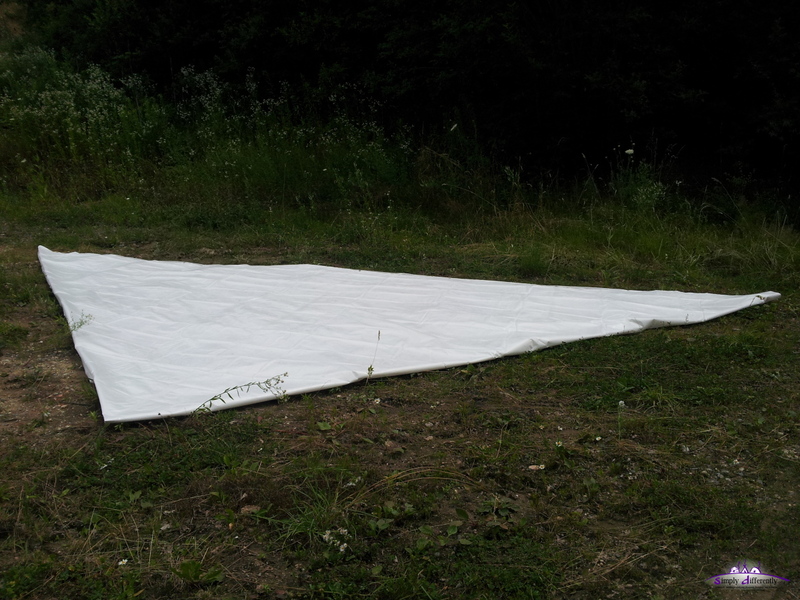 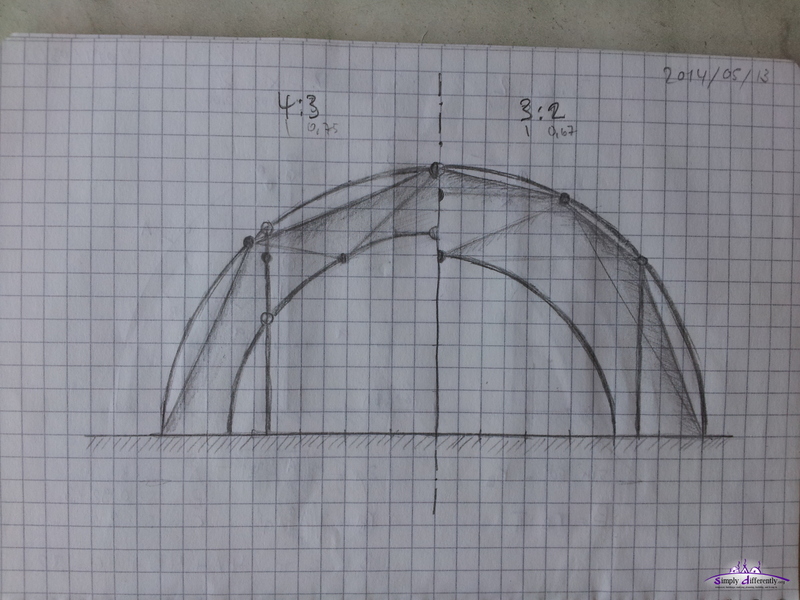 Since the B bow is rather low to step into the dome, I tried a slightly longer B (4m) + 1m = 5m, where A is 6m. 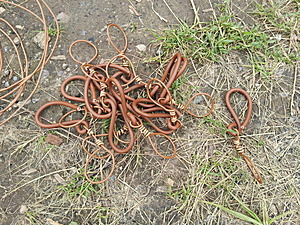 but it didn't make a big difference so far. 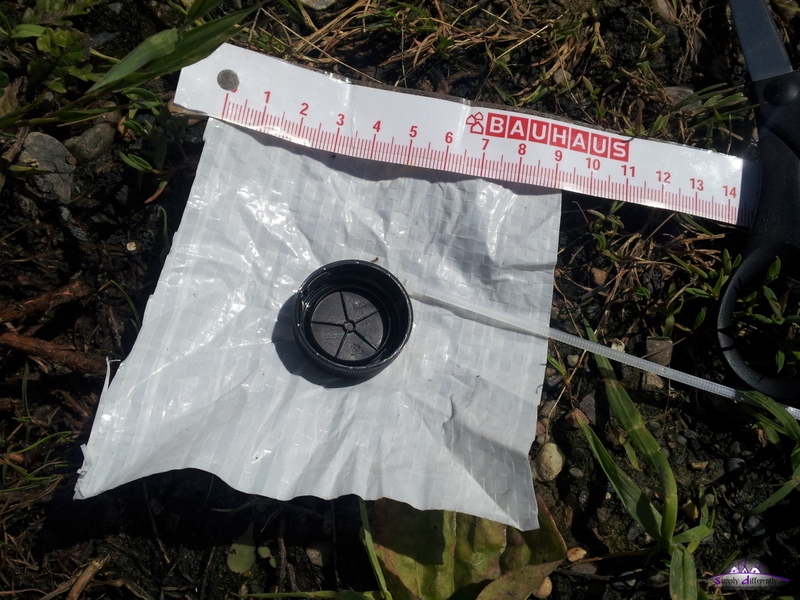 Yesterday purchased 60 x EN25 (2m x 25mm PVC tubes) at EUR 1.30 / pc at OBI.de , but used the M25 "OBO Quick" clips at Bauhaus.info , 100 pc EUR 15.60. 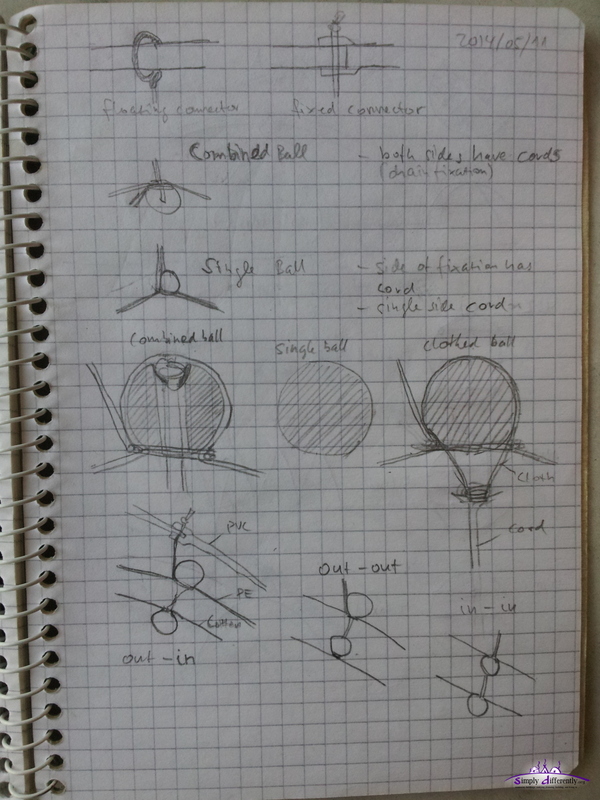 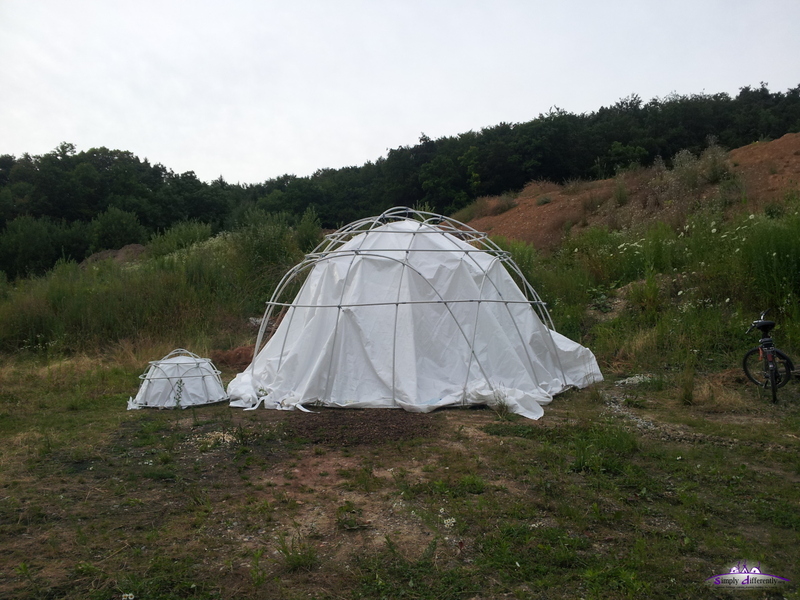 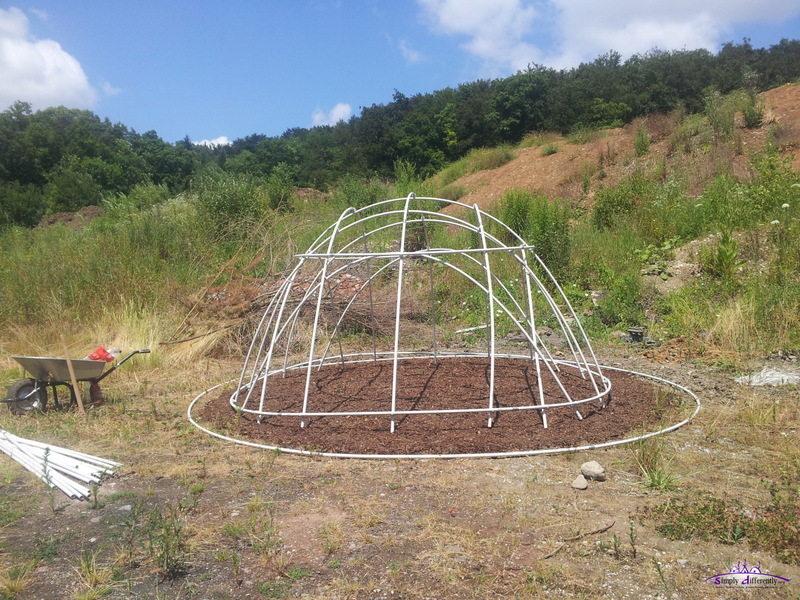 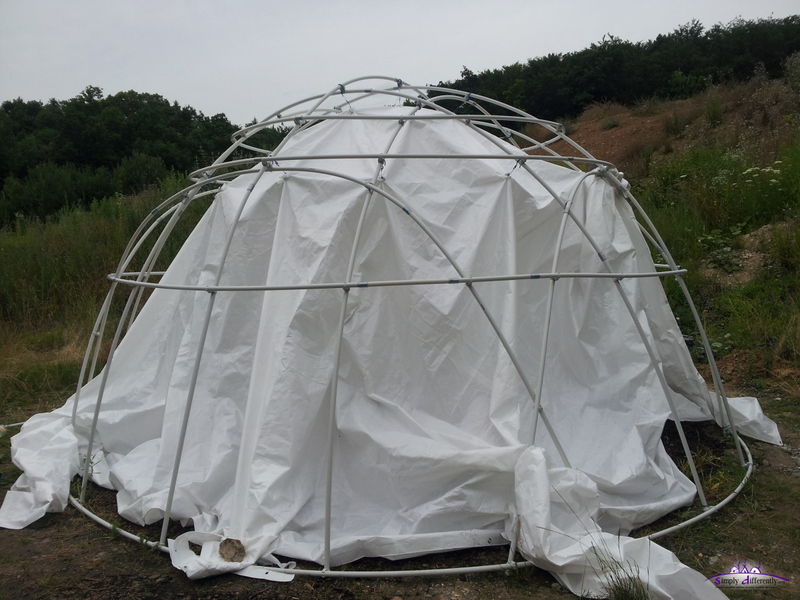 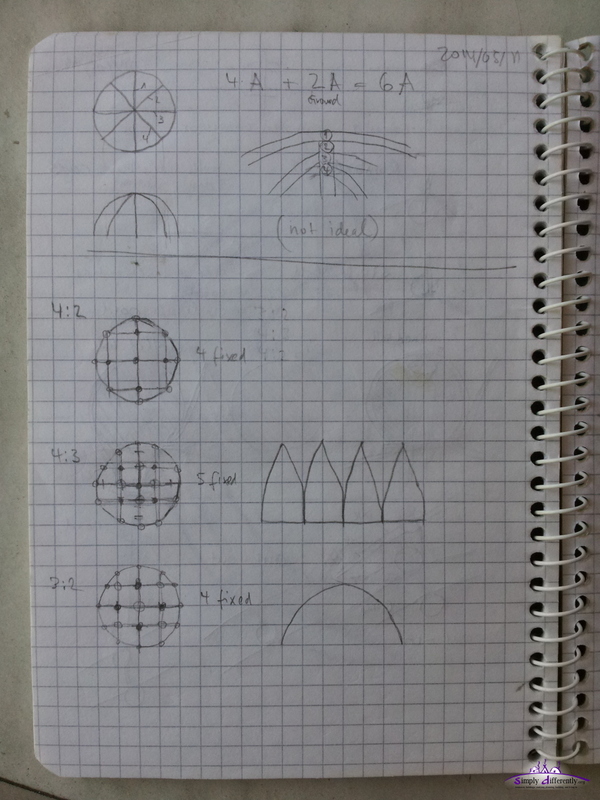 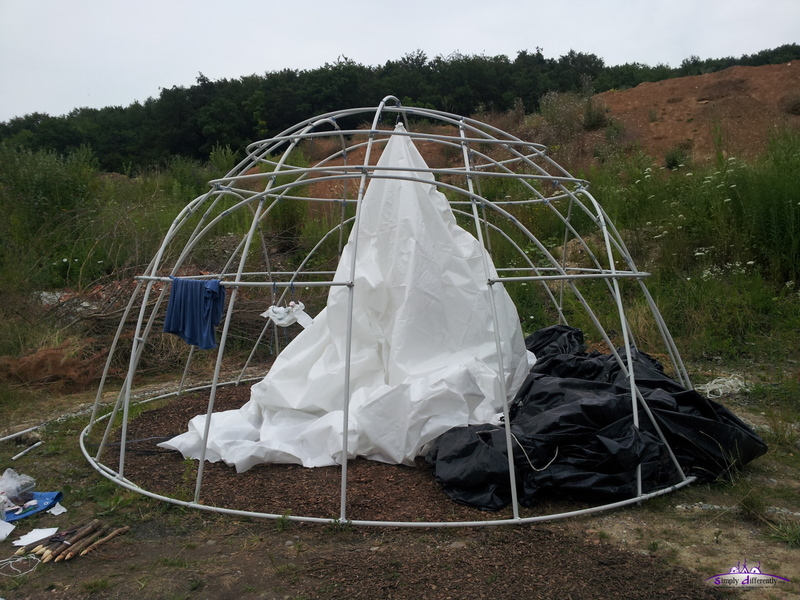 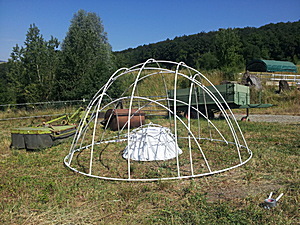 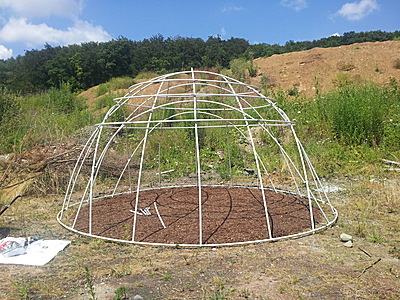 Before doing a full size version of the dome, I thought to test my calculations and choice of material with a small scale 1.27m diameter dome.